As merchants of doom go, Trouble may be one of the most direct spiritual descendants of Black Sabbath. They don't possess anywhere near the consistency of Sabbath, but on the occasions when Trouble put all the pieces together, the earth rumbles, the clouds move in, the wind howls, the women and children run behind closed doors, and then everything goes dark. Psalm 9, the debut (and originally self-titled) album from the Chicago quintet features admirable cover artwork and includes three excellent tracks: opener The Tempter is one of the best songs that the band ever wrote, a full-on Sabbath-inspired assault, with massive, chunky doom-laden chords, alternating between dangerously oozing and just pummeling the terrain. Instrumental Endtime and the title track Psalm 9 are both almost equally as intense and as good. The rest of the material suffers in comparison, and betrays the band's relatively limited creative range. None of the songs are poor; they just lack the needed edge to force themselves into the memorable league. Trouble did distinguish themselves by mixing the sound of doom with bible-inspired, anti-satanic lyrics, setting their music apart from the black metal brigade. 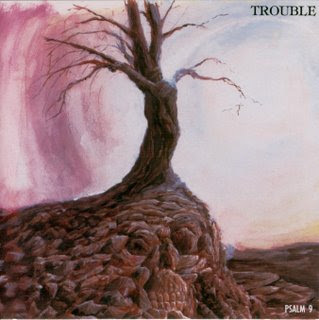 Positive messaging and doom metal may sound contradictory, but Trouble created some excellent music trying to align the two concepts. Produced by Trouble, Bill Metoyer, and Brian Slagel. Engineered by Bill Metoyer. Mastered by JVC.